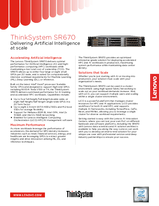 The Lenovo ThinkSystem SR670 delivers optimal performance for Artificial Intelligence (AI) and high-performance computing (HPC) workloads while maintaining a low total cost of ownership (TCO). The SR670 allows up to either four large or eight small GPUs per 2U node, and is suited for computationally intensive workload requirements for Machine Learning (ML), Deep Learning (DL), or Inference. Getting started is easy with the Lenovo AI Innovation Centers, where you can test your own PoC on different hardware and software platforms, including the SR670 with Lenovo data scientists and AI solution architects available to help you along the way. Lenovo can work with you to develop an end-to-end solution for your unique use case with professional services and deep industry partnerships to ensure your success. At Lenovo, we take a customer-centric approach, which is why ThinkSystem servers consistently rank #1 in reliability† and #1 in customer satisfaction‡. Also, Lenovo is the leading provider of supercomputers in the TOP500. Lenovo is trusted by 17 of the world's top 25 research universities to provide scalable, high-performance solutions. The ThinkSystem SR670 provides the latest in performance and reliability in a scalable solution for enterprise and research. OS Support Red Hat Enterprise Linux 7.5; Visit lenovopress.com/osig for more information. To learn more about the ThinkSystem SR670, contact your Lenovo representative or Business Partner or visit www.lenovo.com/thinksystem. For detailed specifications, consult the SR670 Product Guide. † ITIC 2018 Global Reliability Report. ‡ TBR x86-based Servers Report 2018. Trademarks: Lenovo, the Lenovo logo, Lenovo XClarity, ThinkSystem, and TruDDR4 are trademarks or registered trademarks of Lenovo. Intel® and Xeon® are trademarks or registered trademarks of Intel Corporation or its subsidiaries in the United States and other countries. Linux® is a trademark of Linus Torvalds in the United States, other countries, or both. Other company, product, or service names may be trademarks or service marks of others. Document number DS0054, published June 12, 2018. For the latest version, go to lenovopress.com/ds0054.